The Training Begins in Earnest! January is here and the time of unstructured training is over. It is time to get serious about the preparation for my run across The Gambia! The question I receive most frequently from people when they here about my “summer vacation plans” is not the one that first came to my mind. Hardly anyone has asked me: “Oh my – how do you plan to raise all that money?” Instead, people wonder about how I will get my body ready to take on the challenge of running 30 kilometers a day for a period of two weeks in extreme heat and humidity. Over the course of the holiday season, I ran when I felt like it, went as far or as short as I wanted to and didn’t worry much about strength training. I also ate and drank whatever my little heart desired. Now that the new year has begun, it’s time to buckle down. The month of January is serving as my adaptation period to get back into a regular routine of running four times during the week, as well as running longer distances on Saturdays and Sundays. My weekday runs will often double as my commute to or from work – a distance of about 13 kilometers. My partner Marc and I have a great routine worked out where one of us will run to work while the other drives the car. On the way back, we switch. This eliminates the need to run with a heavy backpack containing winter boots, a bulky winter coat and everything else we need for a day at the office. And commuting under our own steam helps us get a workout in, no matter how long and busy the work day gets. Some of the week day runs will be replaced by cross country skiing or snowshoe running. Gatineau Park is full of incredible trails and cross training in another sport will keep the mind and body fresh. Not to mention that embracing winter is the only way to get through it without the winter blues. Weekend runs will start to build this month to approximately two hours each on Saturday and Sunday. While training plans often give detailed information about distances and pace for each workout, Ottawa winters are no time for such precision. Icy paths, slippery roads, deep snow as well as being dressed like the Michelin man and displaying equal grace of movement do not make for fast running times! Time on my feet and perceived effort is all I count in those conditions where distances and pace become arbitrary when we take two steps forward and slide one step back. Yoga will remain a regular part of my workout routine, as the strength I gain from it and the stretching help keep me injury free. Not to mention that it is great fun, as you can read in Limbering up with Yogi B.
Hill training builds strength, too! Towards the end of the month, once my body has had a chance to adapt to being on a regular schedule again, I’ll start introducing a bit of strength training after one run per week. This will consist of lunges, single-leg jumps, squats, as well as some core strengthening. Throughout February, I will gradually increase my weekend long runs while continuing my strength training. Skiing will also remain part of the program, including an annual cross-country ski weekend in Papineau Labelle in the beautiful Laurentians, where we ski from cabin to cabin along back country trails. At the end of February, it will be time to take stock and to build the training plan for the next two months. But how will all this training in the snow and cold temperatures get me prepared for running in high heat and extreme humidity in The Gambia this summer? Winter training will not get my body ready for the physical challenges I’ll face during The Gambia’s rainy season, but it will sure help get me mentally prepared. Stepping out the door to go for a two hour run on a day when the temperature is minus 20 degrees Celsius with the wind chill will toughen anybody up. Learning to cope with extreme conditions during our winter will help me to the same during the heat in The Gambia, where the physical adaptation will take place each day I run. For motivation during the cold months, it is also a good idea to have some interim goals and fun events to look forward to. On my agenda for the spring is the Chocolate Race in Port Dalhousie, Ontario and the Ottawa Race Weekend, where I will run alongside members of Team Love4Gambia who will support my expedition to help kids in The Gambia. So far the adaptation period is going very well and it feels great to be back on a regular schedule. I will keep you informed about my progress and about the next phase of my training plan towards the end of February. Keep active this winter and see you out on the roads and trails! 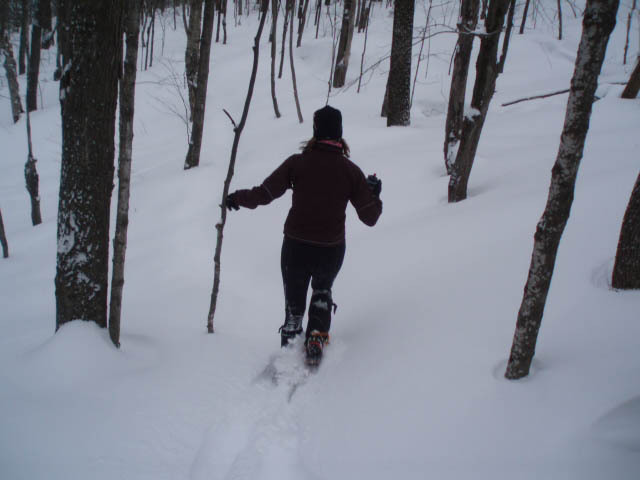 This entry was posted in Ultra marathon training and tagged cross country skiing, cross training, Papineau Labelle, running schedule, Snowshoe running, strength training, strengthening, training plan, winter running, yoga. Bookmark the permalink. 3 Responses to The Training Begins in Earnest! nice pix … who’s the photog that keeps following you around?